A shield volcano takes its name from its shape, which looks like a warrior's shield seen from the side. It's much wider than it is high. Shield volcanoes are built up of a great many flows of runny lava, each of which is relatively thin, only a few meters (yards) thick. Characteristic features of shield volcanoes are lava tubes, underground channels that fed the flows on the slopes of the volcano. Starting from the ocean floor and going to its highest point (the inactive summit of Mauna Kea), the Big Island rises about 10,000 meters (33,000 feet). That's impressive! 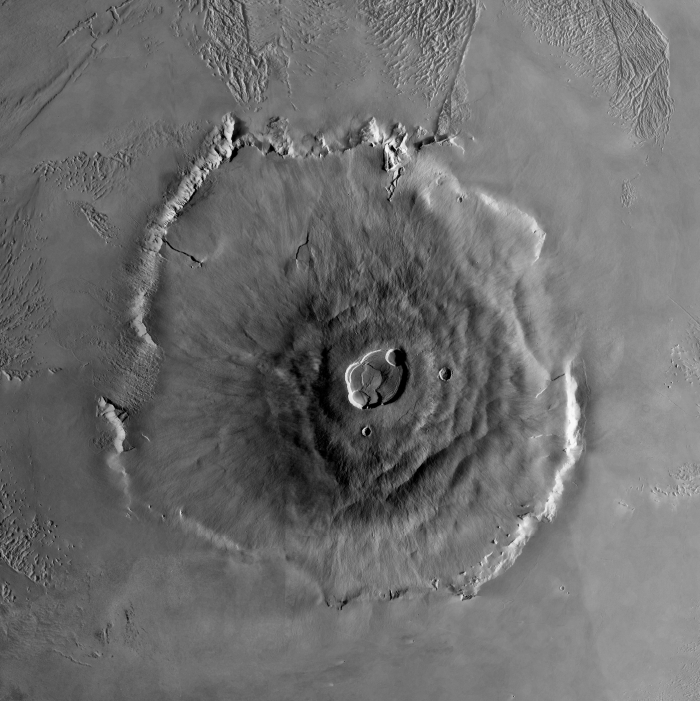 But Olympus Mons is more than twice as high and nearly three times wider than the entire Big Island, including its underwater part. Mars also has smaller shields, called low shields, which are also seen on Earth. They usually have a central vent, occur in clusters, and are not seen in the Southern Highlands. The top of a shield volcano usually has a depressed area. Scientists call this a caldera. A calders forms when the magma that built the volcano subsides in the vent or pipe that fed the eruptions. With some of its internal support removed, the volcano's summit collapses a little. If you see several partly overlapping calderas (as for example on Olympus Mons), it's a sign that magma has risen and withdrawn several times. 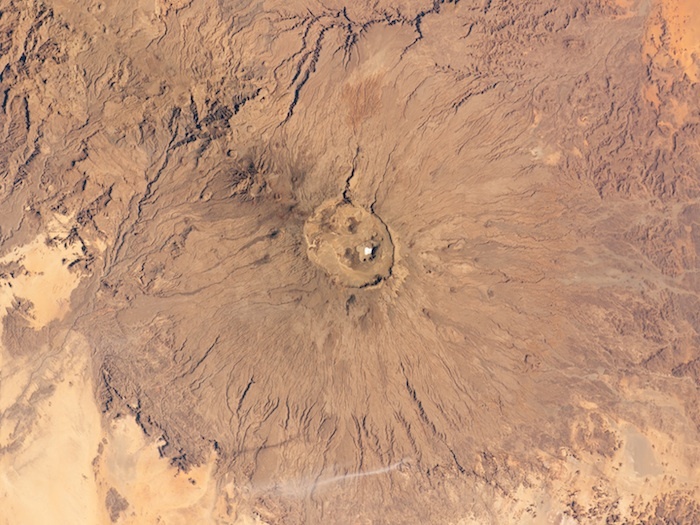 On Earth, a great example of these types of calderas can be found at the Emi Koussi volcano in Chad. If you study the flanks of a large shield volcano, you can see many lava flows, collapse pits, lava tubes , and lava channels that weave around and cover each other. Building a shield volcano is like drizzling lots of chocolate syrup onto a scoop of ice cream. Untangling the volcano's history, flow by flow, is a big job.